10|09|15 - Anyone looking at Arcimboldo’s composite heads for the first time feels surprised, startled, and bewildered; our gaze moves back and forth between the overall human form and the richness of individual details until we get the joke and find ourselves amused, delighted, or perhaps even repelled. Anytransformation or manipulation of the human face attracts attention, but the effect is accentuated when we are confronted with monsters where, instead of eyes, mouths, noses, and cheeks, we find flowers or cherries, peas, cucumbers, peaches, broken branches, and much else. 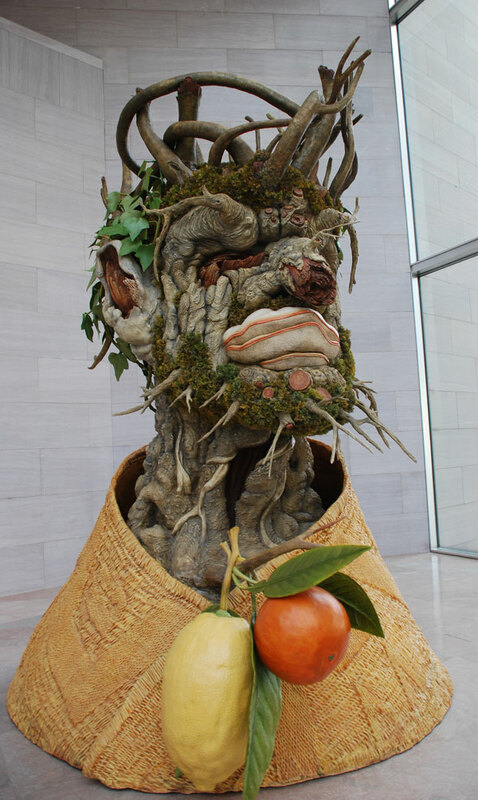 Arcimboldo’s paintings stimulate opposing, irreconcilable interpretations of what we are seeing and thus are paradoxical in the truest sense of the word. 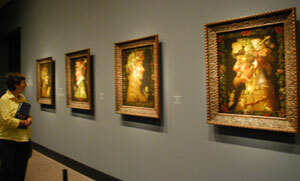 Soon forgotten after his death, Arcimboldo was rediscovered in the 1930s when the director of the Museum of Modern Art in New York, Alfred H. Barr, included the artist’s paintings in the exhibition Fantastic Art, Dada, Surrealism. 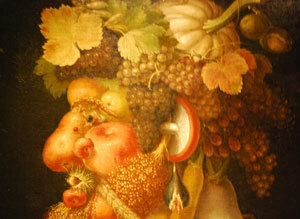 Ever since, Arcimboldo has been considered a source of inspiration for the surrealists and their successors. Art historians have also seen him as a typical representative of mannerism, a term used to describe an artistic style fashionable at European courts in the sixteenth and early seventeenth centuries. Mannerist painters rejected the rational, harmonious approach of much Renaissance art in favor of ambiguity, virtuosity, and elegance. Along with their patrons, they prized artifice, cleverness, obscure symbolism, and intellectual puzzles — all qualities found in Arcimboldo’s paintings.